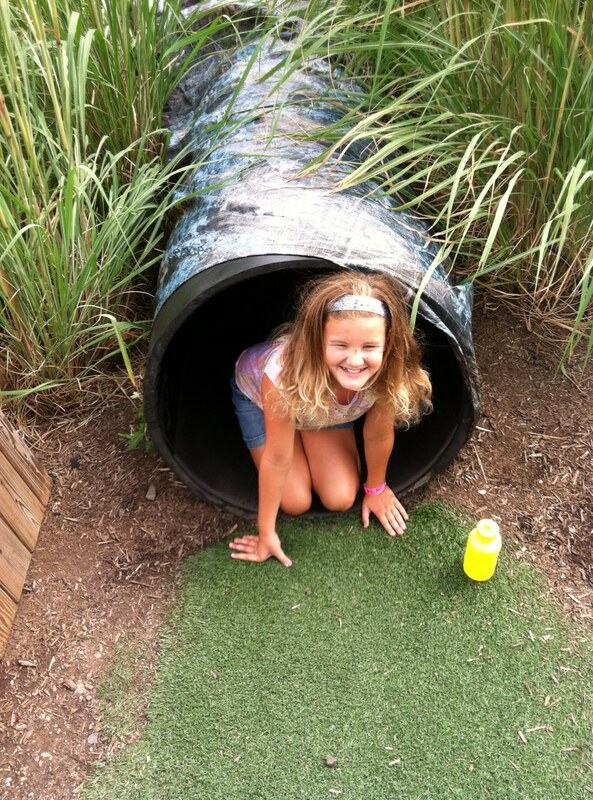 Climbing through the tunnels simulating the life of an underground rodent. We hear that question from Ryan just about every Friday afternoon. He will repeat it several times over the course of each weekend. He prefers the comforts of home to just about anything else, but it’s more than that. Ryan is a relentless planner. He hates spontaneity. Both are very typical traits for people on the autism spectrum. He also craves routine. Home is where he can most closely follow his preferred routines: typing hockey standings, studying old box scores on NHL.com, playing street hockey, watching old games on NHL Network. Ryan does enjoy doing other things, and indeed often complains of boredom when given time to do his own thing. But getting him to step outside of his comfort zone and try something new or different can take a lot of effort. Even when he agrees, there is no guarantee of success. 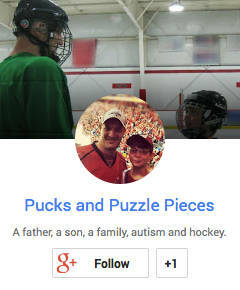 Eleven-plus years of raising Ryan have also given us a good idea of his likes and dislikes, of what types of experiences are more likely to succeed. Purely visual experiences, such as your typical museum, are likely to be an utter failure (as we witnessed, spectacularly, at the Smithsonian). Something participatory, like mini-golf, is much more likely to succeed. And hands-on or not, the subject has to be at least tangentially to his liking or he won’t give the opportunity a fair chance. 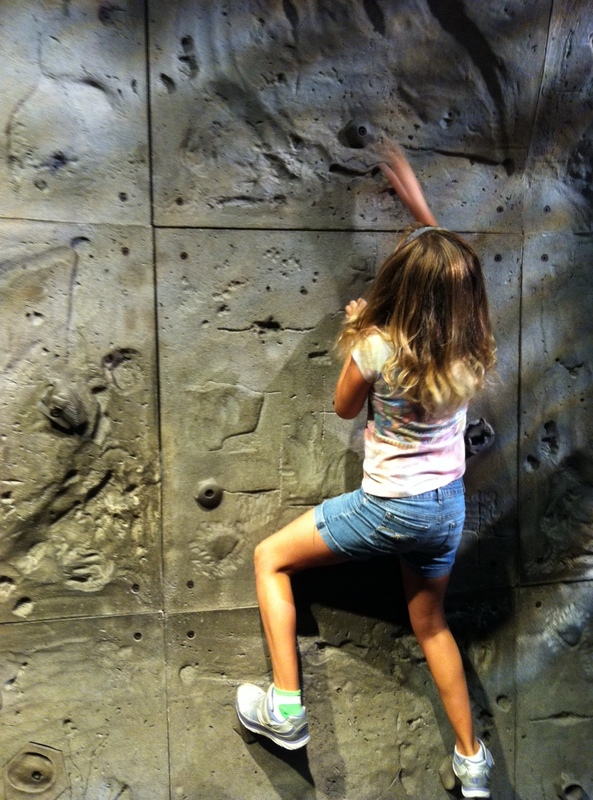 Riley attempts the rock wall at the Liberty Science Center. Riley is much easier. She loves history, science and nature. She is willing to try new things with an open mind. She had been bugging us for some time to take here to the Liberty Science Center, very much a hands-on, kid-friendly museum. This weekend looked like the ideal time. Summer is running down, and once fall hits our weekends will be much more scheduled with activities. Riley was really feeling the need for some one-on-one time with Veronica. There was just one problem. Saturday dawned with Veronica not feeling well, plus had a lengthy errand and task list to prepare for the kids’ last week of camp. She could take Riley, but their time would be limited. I knew Riley preferred to go with her mom, but I saw the opportunity for some daddy-daughter time the likes of which we haven’t had in a while. I told her if she went with me we could spend as long as she wanted in the museum. That was enough of a hook. She agreed, and we set out. We offered Ryan the chance to go, but we knew he would decline. He probably could find a few activities of interest at the museum, but from the moment he walked in, has timer would begin ticking down until the time he could leave. To take him along would be unfair to Riley. Riley walks out on an i-beam, learning what it feels like to be an iron worker. And with that, we were off. To the IMAX (“Space Junk”). Three times through the “touch tunnel.” We donned harnesses and walked out on an i-beam to learn what it feels like to be an iron worker on a skyscraper. We learned how bats and other animals “see” in the dark. We observed the species do fish that live in the Hudson River. We climbed the outdoor obstacle course. We went on the observation deck and looked out at the spectacular New York City skyline. We learned how diseases are transmitted. We learned about forms of communication, from ancient to modern. We tried our hands at reading Braille. Mostly, we didn’t rush. 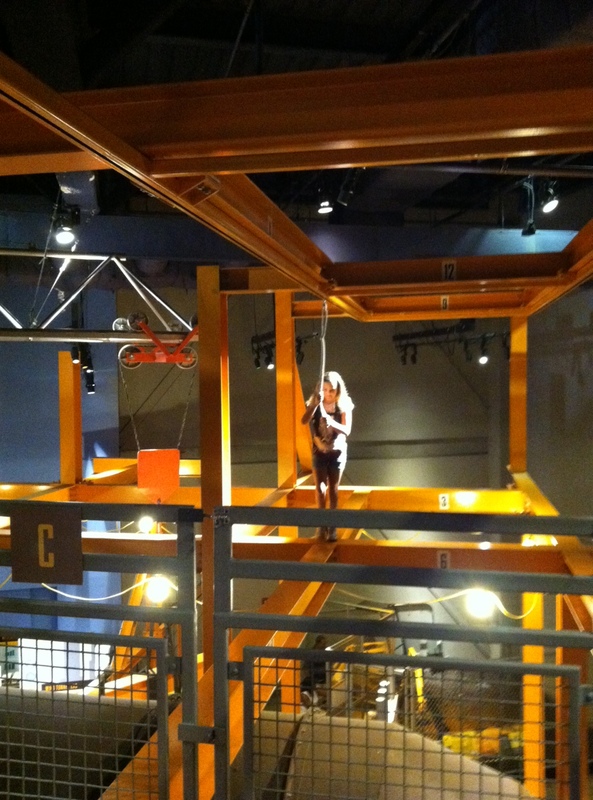 When we had climbed up, down, over, under and through all four floors of the museum, Riley begged off the gift shop!?! to continue to explore. We returned to re-examine a couple of floors we had been through before. She was insistent we would not leave before closing time. I had no intention of rushing her out; I was enjoying this too much. At five minutes past closing, we reluctantly headed for the exit. But I wasn’t ready for this day to end yet, either. The museum is located at the edge of Liberty State Park, which juts out from the New Jersey into the Hudson between Ellis Island and the Statue of Liberty, offering spectacular views of both. At first I just wanted to drive out to the point to show her before turning around, but once we got there we found an ice-cream truck. So we hopped out and got ourselves some frozen treats to enjoy at the water’s edge. Observing the new World Trade Center from Liberty State Park. Riley was inquisitive about everything. She asked about the new World Trade Center, clearly visible across the river. We explored the New Jersey September 11 memorial in the park. She observed bikes for rent and wanted to go for a ride. Spotting the ferry to Ellis Island and the Statue of Liberty, she asked if we could get on. She was clinging to the experience like it was oxygen. I reluctantly told her it was too late in the day to set out on more adventures. “OK, we’ll do it next time,” she told me. It must have been the 15th time that day she had referenced our next trip to the museum, and I couldn’t help but smile. Riley is 10. It won’t be long before she won’t want to spend her free time hanging out with me. Far from a chore, this day was a gift. I was so glad she had suggested the activity and had agreed to go with me instead of Veronica. I treasured this day every bit as much as I treasured my various hockey trips with Ryan. Her brother’s diagnosis makes certain situations unfair for Riley. We have to cut certain activities short and skip others altogether. And yet, I firmly believe, and I believe Riley is beginning to accept, dealing with the challenges presented by autism will make us collectively a closer family and individually better, more caring, considerate people. Still, it can be nice to leave all that behind for a day and just drink in the wonders of my daughter’s inquisitive mind. I can’t wait for our next opportunity. That’s a beautiful post! So glad you and your daughter had a great day together. You can’t always plan for those days to happen, but you have to be poised to leap at them when they come! Thanks. It really was a special day. I need to make sure to appreciate opportunities like that when I am in the moment. Time goes so fast. Loved the photos! She is growing up so quickly I want to put a book on her head and stop it!